Oklahoma’s Teacher/Leader Effectiveness System (TLE) is highly flawed. Ask anybody in a school, and you will hear that. Sure, some like the qualitative part that will eventually comprise 50 percent of a teacher’s overall rating. They say it has improved the language of the evaluation process. Unfortunately, it has also increased the extent to which teachers and principals are over-burdened with paperwork. It is a thorough process, but it is also terribly cumbersome. This disruption to the status quo, however, has nothing on the impending disaster of the other 50 percent. When the quantitative component of TLE becomes reality, the bottomed-out morale of teachers will find a new low. Anybody who teaches or supervises teachers understands this. The future former state superintendent does not. Last night, Janet Barresi posted one of her final missives (at least in an official capacity), this time defending the TLE and refuting some of the concerns we’ve voiced for years. As usual, though, she misrepresented many, many things. I will attach a few excerpts and then respond. When properly implemented by districts, TLE is not an excuse to fire teachers. We cannot and will not fire our way to a better education. TLE allows for focused professional development. It is a carefully designed system that helps good teachers become great, and struggling teachers become good. Actually, this sounds like the justification of someone who hasn’t read the statutory language associated with the process. I understand – the relevant section doesn’t appear until pages 13-14. By then, most politicians have stopped reading to learn and commenced handing the document off to the underlings with instructions to brief me at a later time. Here’s the short version. Both career and probationary teachers who receive a less-than-effective TLE score for consecutive years can lose their jobs. Even if the principal observes good instruction happening in the classroom, an algorithm can override human judgment. Also, as I discussed Sunday, teachers who have the opportunity to make their own assessments (pre- and post-tests) will have a huge advantage over their counterparts. Still, Barresi warns us against the perils of abandoning evaluation by test score. Some critics contend that TLE gives too much weight to student performance on assessments, but I believe the system we have designed strikes a good balance. It is important to recognize that student data is valuable. How can school leaders make informed decisions without indicators and data to guide them? How can parents feel assured they have an impartial measure of their school’s success if they only hear qualitative observations? Removing student data from TLE would threaten Oklahoma’s waiver from disastrous No Child Left Behind regulations, but even worse, it would usher in an accountability system that lacks measurable accountability itself. Remember, Barresi and her ilk share the belief that anything you don’t measure doesn’t matter. As for me, I count two negatives in the previous sentence. It matters. Seriously, though, Barresi still believes school leaders need her help to make informed decisions. We do use data, even if she won’t give us credit for it. As for assuring parents, I guess that’s what disembodied algorithms developed by out-of-state non-profits that have taken millions from our state are for. I’ve seen too many examples from this year’s VAM data that show great teachers with low scores. Even in cases where every student passes the state tests and most are advanced, the teachers are being labeled ineffective. Explain that to parents. Furthermore, we’ve lost the waiver once. If we lose it again, we’ll cobble something together and get it back. I’ve seen us do it. Our work in school turn around has shown that as the hard work moves forward to improve instructional processes and practices, change the culture of the school and initiate the use of data as an integral component of improving instruction, that TLE scores also improve. Rob Miller effectively took down this talking point recently. The SDE thinks they’ve discovered how to turn schools around. As Rob showed, they’ve also effectively discovered how not to turn schools around. Essentially, in any ranking system, there will be winners and losers. The system can’t help it; it was born that way. This is true for schools, for teachers, and for kids. Some will score high, and some will score low. Left to their own devices, some will rise, and some won’t. Placed under intensive scrutiny from the state, some will rise, and some will fall. It is a natural by-product of the system; often, what appear to be gains (or losses) are merely statistical corrections. No state agency deserves credit for schools that regress to the mean. I don’t believe that the “sole purpose” of TLE is to fire people. I know that it will happen, though. Good teachers will lose their jobs because of bad data. Whether or not the intent of TLE is to shame teachers and schools, this will be the outcome. No amount of spin from Janet Barresi, Arne Duncan, Jeb Bush, or anyone else will change that. As Superintendent-elect Hofmeister has traveled the state, she has heard some version of these concerns again and again. Our legislators have heard them too, and most seem to understand that something has to give. In policy terms, it probably will come down to a choice between delaying implementation of the quantitative score or tossing the entire TLE system. The timing of this letter is curious. It makes me wonder if Barresi has a last-minute surprise for us at tomorrow’s State Board of Education meeting. This will be her last one (unless they do not choose a vendor for spring testing, in which case there may be a special SBE meeting early next month), and the agenda for it should post this afternoon. We can only wonder right now if this is a clue to what we’re going to see on it. I pretty much took Easter weekend off from blogging but made a quick appearance on Twitter tonight while working on my end-of-month post. Once again, Representative Jason Nelson (R-OKC) has taken the position that he can’t support more funding for schools until he has a number of how much is enough. Several Oklahoma educators have pointed out to Nelson that with rising enrollment, reduced funding, and a whole slate of reforms, we’re nowhere near enough. I think he gets that, but I honestly don’t have an answer. At no point have we done an honest analysis of the “true cost” of public education. If we did, we’d have to admit that it’s not the same in Tulsa as it is in Poteau or Guymon. So while he has a point, it’s a pathetic excuse for the inertia of the growing school funding crisis. CCOSA Call to Action – Parent Trigger – Oklahoma educators continue to have concerns about this legislation. It will pit parents against schools and even against each other. More importantly, there doesn’t seem to be any discernible push from a recognized parent group for the law. In short, it is a classic example of a solution in search of a problem. That won’t stop our legislature though, unless parents from around the state remind them that they are here to serve Oklahomans, rather than ALEC and FEE. Senate Bill 1001 – Parent Trigger – In case I didn’t mention it clearly, I’m not a fan of the Parent Trigger bill. It seems blog readers aren’t either. The top two posts this month were ones that were critical of the proposal. In this one, I also linked to an article about a Florida school where the parents wanted to fire the charter school company, which then was taking them to court. Seriouly. This is where we’re headed if we don’t stop following Jeb Bush. Two Year Delay for TLE? – Readers were also enthusiastic this month about the possibility of the SDE getting a two year reprieve from trying to figure out how to calculate value. I hope they get it. And in the meantime, I hope we can have a discussion about how to calculate votes. There has to be a better option out there. And Then There Was Roster Verification – We added to our vocabulary this month, as the state announced a plan to pilot a program to calculate the percentage of student time spent with each teacher, pretty much from day one of school. This way, we can hold Pre-K teachers accountable for the number of students who graduate 13 years later. I am told, however, that roster verification will not calculate how many days each student came to school hungry or traumatized from some event that caused an amygdala hijacking. As always with things that are tied to TLE, we should remember that the SDE staff over this program have never had to evaluate a single teacher or principal. 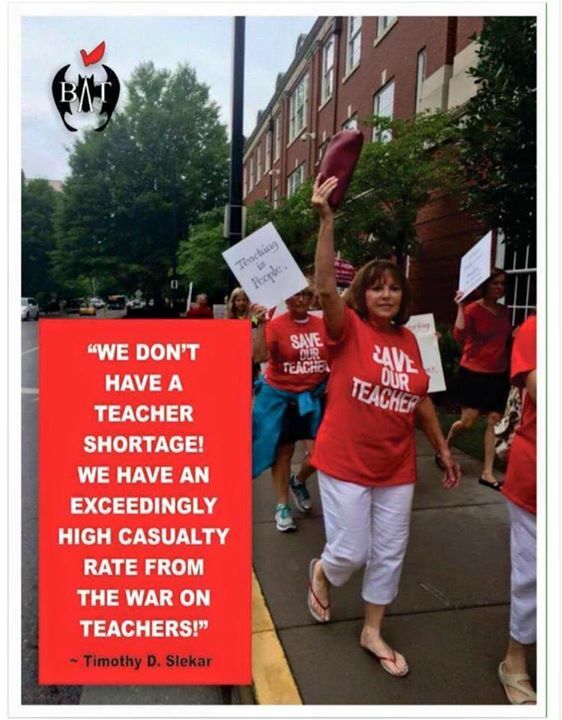 Teachers Respond to TLE Commission and Senator Mike Mazzei’s Response to a Patron (tie) – A group of Jenks teachers wrote a spirited response to the TLE Commission early in March and got a cursory response. I am unaware if there has been any follow-up, however. There was a response given by a state senator to a patron about SB 1001, however. In it, Mazzei (R-Tulsa) made it clear that this law would never apply to suburban districts anyway. It’s really targeting the urban schools. And no, that’s not at all patronizing. April is going to be an important month to be active. Once again, everything from funding, to ALEC/FEE based policy decisions is on the table. There will be another push for school consolidation. One thing we know is that there are hundreds of superintendents, thousands of principals, tens of thousands of teachers, and hundreds of thousands of parents in Oklahoma. If we can be a little more well-informed and a lot more vocal, maybe this will be the month it all turns around. Two Year Delay for TLE? OKLAHOMA CITY (March 19, 2013) – State Superintendent Janet Barresi announced today that she will ask the authors of Senate Bill 426, Sen. John Ford and Rep. Earl Sears, to consider a two-year delay for full implementation of the Teacher and Leader Effectiveness reform that was originally enacted in 2010 in Senate Bill 2033. “Nothing is more important than assuring that each child in our state has the opportunity to be taught by an effective teacher and school principal. We will continue to work with the TLE Commission and the State Board of Education to build a model program and quality technology infrastructure to support the program. I appreciate Gov. Fallin’s support in this decision and our work,” Barresi added. Superintendent Barresi suggested the timeline for implementation of the qualitative or observational component of the system is currently being piloted this year and will be fully implemented in districts for the 2013-14 school year. If SB 426 passes, the Other Academic Measures portion of the quantitative component will be piloted next school year and implemented in 2014-15. The 35 percent accountability measures of the quantitative component will be implemented in the 2015-16 school year, making TLE complete. SDE staff have been very direct for months now that they would be asking for this delay, which will be appreciated by most teachers and administrators. If they need more time to work out the details, that’s fine. The cynic in me believes that something else is happening here, however. Two things are missing at this time. First, as we heard back in January, the SDE is getting input from SAS to develop a model for creating a VAM model. (Yes, that was three acronyms in a single sentence.) Without a mathematical equation that includes factors both within and outside of a school’s control, there won’t be a value-added measure. This would make the recommendations of the various working groups meaningless at this time. The other piece in development is a more refined student data system – one that can effectively track where students were and for how long and which teachers impacted their learning and for what percentage of the time. That brings us to roster verification, which I wrote about last week. This is a new experiment that the SDE wants to run before full implementation of TLE. If we start calculating the quantitative portion of the evaluation without these pieces, it will be harder to add them in. A delay will ensure that VAM and roster verification will be a piece of the enacted system. It will also guarantee that we will have conversations like those taking place in Florida right now – ones in which successful teachers get low ratings because of the students they do not teach. Call me ungrateful, but rather than waiting to get it right, we should instead acknowledge that the entire concept is fatally flawed. Update: the SDE press release is back. We the undersigned and highly qualified specialists at Jenks East Elementary School urge our legislators to seriously explore the quantitative component of TLE before 2013/2014 implementation. Below you will find our “real time” experiences and “real voices” speaking facts which must be considered before Oklahoma implements a “one-fits-all” approach for evaluating educators and determining their compensation. This insightful four-page letter didn’t just go to the SDE, however; it went to the 250 members of the TLE working group. And they told two friends. And they told two friends. And so on. And so on. And then it found its way to your friendly neighborhood blogger. It’s the gift that keeps on giving. Thank you for your careful thought, consideration, and time in preparing the document you provided for us. We appreciate your input and respect your perspectives to this challenging work. The working groups’ final recommendations were presented to the TLE Commission for initial consideration on Tuesday, March 12, 2013. I will share your additional input with Superintendent Barresi, who is also the chair of the TLE Commission. If she has any questions or follow-up requests, I will get back in touch with you. I’m glad that our state has some teachers not taking this quietly. Read the whole letter. It’s worth your time.